Age: 13 years old Class: Year 1 Middle School - 7th Grade Height: 156 cm (5'1") Weight: 51 kg Haru's and Taku's childhood friend. Although she is dating Takumu, she also cares a lot for Haru. Her non-accelerated avatar is a catgirl. In volume 3 of the light novel, she decides to become a Burst Linker with Taku being her 'parent'. Her Duel Avatar's name is Lime Bell. 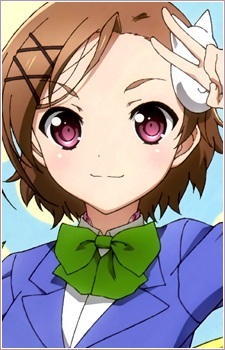 It is a unique avatar because it has the special ability to restore HP, an ability only shared by 2 other Burst Linkers, one of which is no longer in the Accel World due to the pressure of possessing the rare ability. Her main goal as a Burst Linker is to rekindle the close friendship she, Taku, and Haru once shared, fearing the game is tearing them apart. Kuroyukihime wonders if she is mentally strong enough to use Brain Burst, but the group eventually gives in and gives her the program. To her friends' surprise, the program installs successfully. In truth, her ability is not to restore HP but to turn back time to the point that the Duel Avatar did not receive damage. Lime Bell's bell, according to Chiyu, sounded like the chime of the school bell back in grade school. Her inner conflict was that she wants to turn back the time to that point where the three of them were good friends.